Paper and photographs can’t take the heat. Or the light. 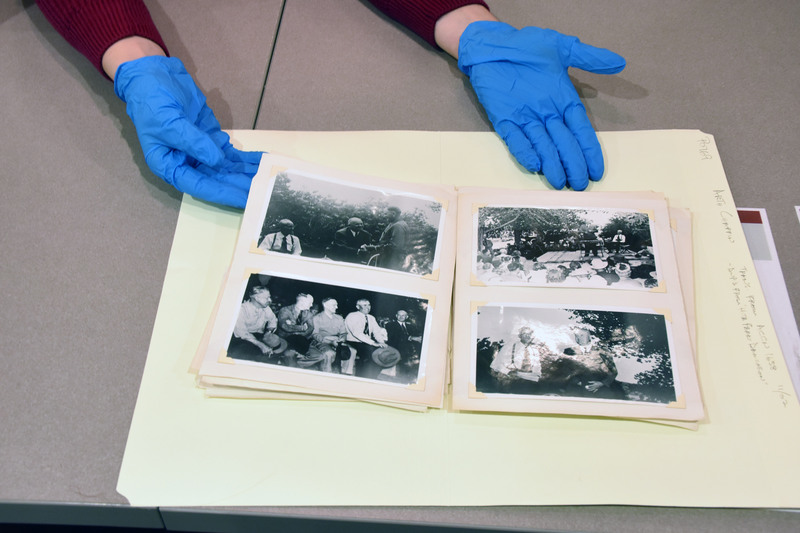 Both elements cause historic, fragile documents to breakdown over time, much to the dismay of curators of the Special Collections at the Marriott Library. Enter a trio of students — Sierra Govett, Dillon Seglem and Yinhuan Huang — in search of a project for Jennifer J. Follstad Shah’s environmental and sustainability studies capstone class last spring. Govett initially proposed they tackle excessive light use across campus, especially at times when buildings are unoccupied. “A lot of buildings on campus have lights on more than they should and we wanted to find some place we could address lighting at a large enough scale to make a difference, said Govett. But the students abandoned that idea after realizing vast differences in lighting systems from floor-to-floor and building-to-building would make a standardized solution impossible. Bill Leach, sustainability project coordinator for Facilities Management, suggested the students instead look at what might be done to address lighting concerns in the Marriott Library. Ian Godfrey, director of library facilities, was “not only excited about the prospect of a lighting controls project, but had an area in mind,” Leach said. Leach, Godfrey and Emerson Andrews, Sustainable Campus Initiative Fund (SCIF) coordinator, helped the students conduct an audit of the space, come up with a plan and develop a budget. Light and heat take a toll on fragile documents in the Marriott Library’s Special Collections area. Their idea: install a new lighting system with LED bulbs that are motion and daylight sensitive. Lights above each row activate only when someone moves into the area and there is insufficient daylight. The students applied for and received a SCIF revolving loan of $40,000, which paid for installation of a new lighting system over the summer. The loan fund is specifically used for energy and money saving ideas proposed by students, faculty and staff for energy conservation, renewable energy production and water conservation projects. A Rocky Mountain Power wattsmart incentive grant helped off-set some of the project’s cost. The library will repay the loan over 13 years, using money from utility cost savings. But the impact — both monetary and in preservation of its collections — will be ongoing. “I am thrilled that this project, initiated by these three students in my capstone class, is coming to fruition and will help to reduce the campus carbon footprint while preserving library resources,” said Follstad Shah, an assistant professor in environmental and sustainability studies and research assistant professor in geography. The SCIF revolving loan fund used in the project is available to all students, faculty and staff who have an idea for saving energy and money. It has paid for other energy projects, such as solar panels and heating system upgrades, but this is the first lighting project, said Myron Willson, deputy chief sustainability officer. “We were pretty excited to do something that made such a difference,” said Govett, who graduated last spring with degrees in environmental studies and ballet. Govett and Seglem toured the retrofitted space for the first time in mid-November. “It’s really cool to come in here and see it working with the motion sensors and all,” said Seglem, a senior majoring in environmental studies.